Lessons from Life: When I was in the Army, it seemed an easy way out of my problems. Whenever things piled up and I began to think I couldn’t handle life, I always took a walk. There was something that happened to my mind while I walked. It felt like I exited my life for awhile while partaking in an activity that fascinated me. Even when I was little I was intrigued with the idea that my legs could carry me places. My legs were the transports for my torso. I thought how they coordinated my movement without me consciously thinking of every moving part was amazing. I hoped I could always have my legs in working order so that I would be able to enjoy this wondrous movement. 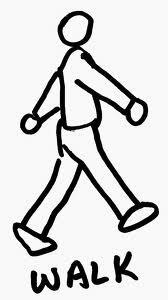 Walking still is my second favorite exercise after bicycling. I noticed back then I was able to take in the sights of activity and nature all around me. It gave my brain new things to contemplate. I could become an observer of life for a time instead of a participant. I noticed things I would never have seen had I been driving a car. Then I observed how in this refreshed state that new ideas, even solutions would pop into my head. Now I wonder if walking has a way of emptying our mind of thoughts and preoccupations so that any problems which may be bothering us can become the focus of all the mental energy we have at our disposal. It could be. I still enjoy walking for its exercise value and while listening to my iPod still find myself just watching life for awhile instead of participating in it. Has it been awhile since you’ve enjoyed the benefits of a good walk. If you can, why not take a walk today and see how it makes you feel. This entry was posted in Animals, Contentment, Creation, Creativity, Enjoyment, Exercise, Feelings, Focus, Fun, Guidance, Happiness, Health, Life, Military, Nature, Peace, Perspective, Quiet Time, Stress and tagged Enjoyment, Fear, Identity, Quiet Time, Renewal, Stress, Worry. Bookmark the permalink. I walk to and from doorsteps all day long and get paid. I will think about this as I deliver today.